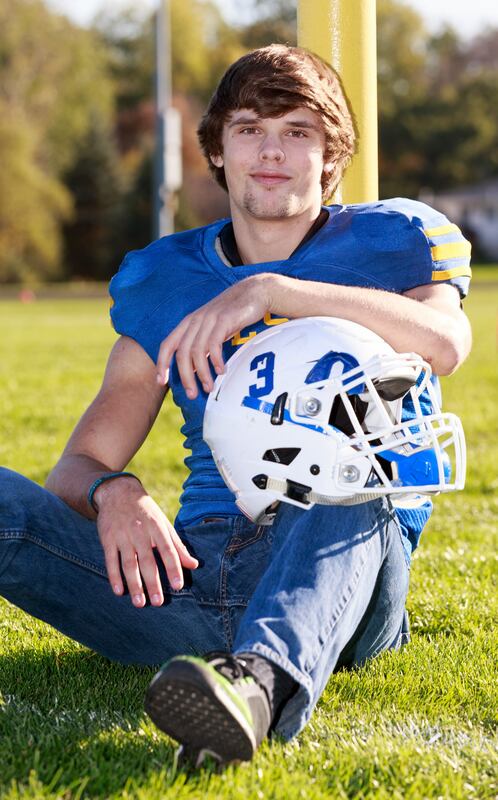 When Ben Chossek first was named New Berlin West football coach last fall, one of the first people he was told about was running back Max Meleski. "Max was one of the first kids they talked to me about after I took the job," Chossek said. "As a player and as a human being he was someone who had stood out from previous years. They wanted to make sure we communicated with him right away." "No. 1 they said he was an excellent football player, who had a good junior season," Chossek recalled. "But he was also a leader through his actions every day, dedicated to the sport. "He was a strong student, making good decisions outside of the school and community and representing us very well." Chossek received some good advice. Meleski finished the regular season with 1,186 yards in 203 carries, a 5.8 average and he caught 6 passes for 128 yards, an average of 21.3 yards per catch. He had 18 touchdowns rushing and one receiving. Counting the 33-6 playoff loss to Catholic Memorial on Oct. 21, he finished the year with 1,206 yards in 222 rushes and a 5.4 average. He had 7 catches for 131 yards for 18.7 average and a score. He was a workhorse, rushing for 209, 208, 157, 137, 119, 112 and 104 yards, with three games of 4 TDs, two with two, and two games with a TD. And getting that many touches was something new for the senior. "I'm going to be honest with you," Meleski said. "The coaching change was a huge adjustment for us. We have a whole new offense this year, a whole new system to learn. I thought I would still be splitting the carries three ways. I'm the workhorse. Yeah, it's definitely tiring. But I love it." Meleski was a running back as a freshman after playing wide receiver and defensive end in middle school. After his freshman year he went right up to varsity. 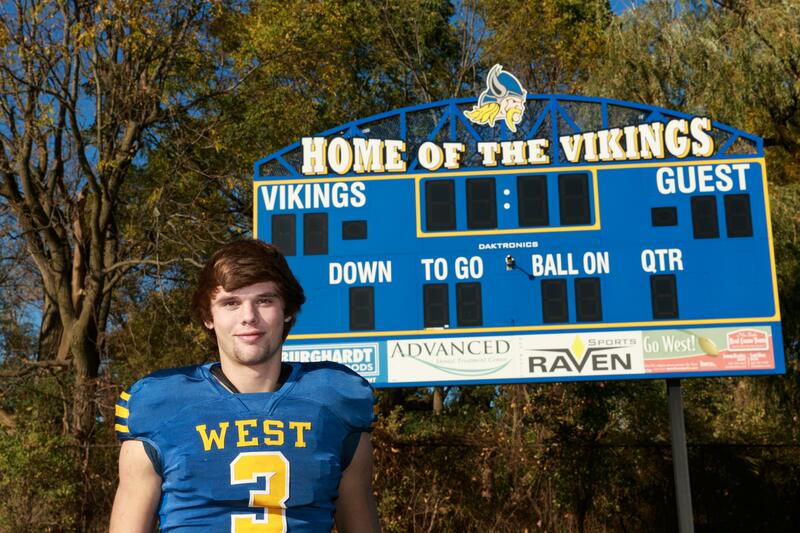 "I was a running back right away and I was on two special teams," he said of his first two years at West. "They were kind of grooming me for the next year (junior). I didn't get all the reps, but I did start for a couple of the games, but I got a decent amount of reps for all the games." Meleski, who should earn all-conference honors this year, was the Pick n Save student-athlete of the week in August of this season. He was an honorable mention all-conference choice as a junior and a scholar athlete as well. "He has tremendous speed for a tall, wiry guy (6-feet, 1 inch, 185 pounds), but he has excellent strength as well," he said. "Those two things are what separates him from some other kids who are strong or fast but not both." With Meleski being a key player on and off the field, Chossek talked about his leadership skills. "Max is a quiet leader. He leads by example," Chossek said. "Not that he won't say anything, but he is more the type that will pull someone aside and talk to him individually than do it in group. He's not rah-rah." Chossek pointed out that Meleski's backup got hurt during a game and they had to wait for an ambulance. When his parents came out, Meleski introduced himself to them and asked them to please keep in touch with him and let him know how their son was doing. "He's a kid that takes a genuine interest in other people," Chossek said. "He makes good decisions and is just a quality human being. I think that says a lot about his family as well. I have a younger daughter and as she gets older, I hope he is the type of person she is hanging out with." From a team's point-of-view, the Vikings made the playoffs for the first time since 2013, Meleski's freshman year. He remembers standing on the sidelines watching the game. Chossek talked to the team about what they wanted their legacy to be. "At the beginning of the year he said 'Do you guys want to be known as the class that made the change, made the difference, got this program back to where it needs to be,'" Meleski recalled. "We all said 'yes.'" Chossek felt his team came through for him this past season. "When you get an opportunity to coach a team that hasn't had a lot of success, one of the things you're hopeful for is that the seniors and the older kids have an opportunity to make some change. "When people look back, what do you want them to say about your group. This group's legacy was not only their results, but what they did every day." FAVORITE MOVIE: Lone Survivor, Action (War Movies). FAVORITE PLACE YOU VISITED: Alma, Buffalo County at family cabin. WHAT DO YOU DO TO RELAX? Bowfishing, Hunting. FAVORITE SPORTS RIVALRY/ATHLETE: New Berlin Eisenhower. MOST MEMORABLE SPORTS MOMENT: Playing with his brother, Sam, who is a sophomore this season. WHAT WOULD YOU LIKE TO DO IN THE FUTURE? Go to college. Something in the medical field.